Wednesday, March 30, 2011, was another productive day for Upper Deck’s hard-working personnel. Four team members from company headquarters – Brandon “Boom Boom” Miller, Kevin “The Sports Fanatic” Gniadek, Jodi “J-Wow” Wasserman and yours truly, Terry “T-Bone” Melia – arrived in the Lone Star State and immediately went to work setting up the company booth at “Bracket Town,” the much-anticipated college basketball show surrounding this week’s NCAA Final Four battles in Houston. We broke down boxes and boxes of Upper Deck product; repositioned oversized blowup cards inside huge acrylic stands of guys like Magic Johnson and Tom Izzo (both from Michigan State), Larry Bird (Indiana State), Jim Boeheim (Syracuse) and exclusive UD spokesman Michael Jordan (UNC); and set up some pretty impressive pieces of Upper Deck Authenticated signed memorabilia to exhibit at the show. Brandon Miller, foreground, repositions the Bird blow-up card. 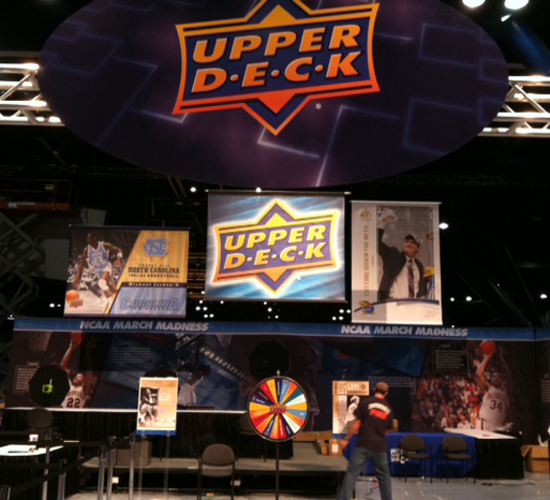 The booth is nearly ready for Upper Deck's fans! Truth be told, we did make one detour on our way to the Houston Convention Center. Hungry as ever when we landed at George Bush Intercontinental Airport, we grabbed some local cuisine at a barbecue joint that specialized in (what else?) ribs, beef brisket and tasty chicken. Once we refueled, we hit the ground running at the convention center. Dozens of other show exhibitors were setting up alongside us, but we stay focused and spruced up our booth in just a few hours. A few hammers, screw drivers and wrenches later, we were standing inside one of the best-looking company booths in Houston. 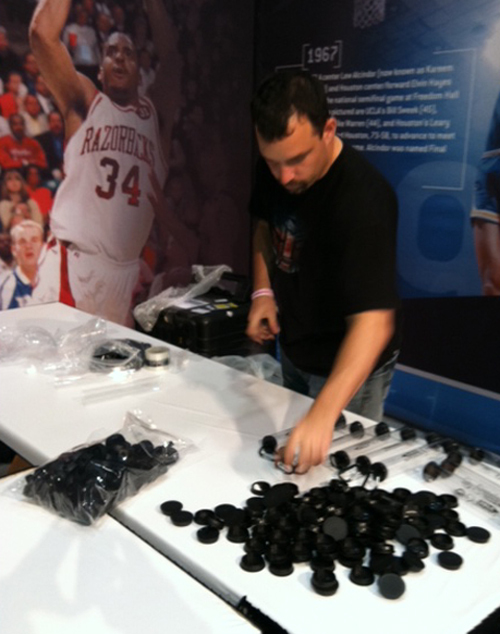 "The Sports Fanatic," Kevin Gniadek, assembles UDA's latest product accessory: "Sig Safe" autographed photo protectors. These should be a big hit at the show. The pictures here tell the set-up story, but the thousands of people who will be filling the aisles over the next five days will write a new chapter in Upper Deck’s exclusive contract dealings with the Collegiate Licensing Company. So if you’re in Houston this week, please pay us a visit; you won’t be disappointed. Upper Deck’s always popular “Spin Wheel” will be in full force as show goers will be battling each other in card wars, pack wars and sports trivia contests to win cool giveaways. Come one, come all, just make it down to Houston. Rest assured, you can hitch your star to a good time supplied by the folks from Upper Deck! 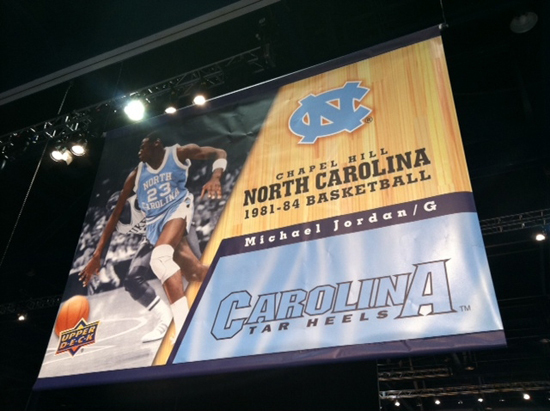 Michael Jordan is ready here at Bracket Town, are you?? ?